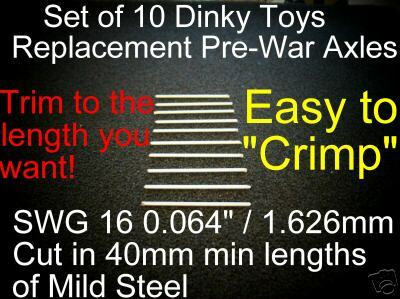 This is for a pack of 10 (Ten) replacement "Dinky Toys" very close to the pre-war specification wheel axels originally made by Dinky Toys..
employ to give the effect they desire. are fitting them to for instance a Pre-War Dinky Toys 35 Series will take a shorter axle than a Pre-War Dinky Toys 39 Series model. So each purchase is for a pack of 10 Axles enough to do 5 models! Quality product, well packed. I have used these restoring 25 series models and currently a 151b. I prefer not to use Mole grips but crimp the ends in a small vice.